If you've ever watched "Canada's Worst Handyman" or "Canada's Worst Driver," you probably found yourself in hysterics before the show was over. You've also probably been left wondering if the dim-wittedness that saturates the shows was staged. Host Andrew Younghusband says it's not staged. They are real people who simply have no clue how to do things the right way - but they provide for a masterful piece of reality comedy. The number one question people ask Andrew about the participants on "Canada's Worst Handyman" is whether or not there are actually people out there who are so inept at handy work? "They are not acting. They are trying their damnedest," Andrew says. "We had a woman on the show a couple of years ago who insisted that some people have no common sense, that they were born without it and they'll never get it because they can't figure out common sense." He says it's hilarious to encounter someone who insists that the failure of the project is not their fault simply because they have no common sense. To that he responds, "We're all born without common sense, my dear. I spent the first two years of my life sh*tting in my own pants...For two years it didn't really dawn on me. Just because you're born without common sense doesn't mean you can't overcome it." Andrew is in his glee as host of "Canada's Worst Handyman" because he's reliving his own D.I.Y. mistakes through the misfortunes of the participants on the show. At the age of 19, he bought an old house in New Melbourne, Trinity Bay, Newfoundland, for $7,000 - a real fixer upper. "One of the reasons I'm good at that job is because I've got this house that I've had for 20 years. When I got this house you could put the car keys right in through the side of the building it was that rotten," he recalls. "So, every single thing that's been done on that show badly, I've done worse. So to see those people doing that stuff, that's one of the reasons I get it. It's one of the reasons I relate. I've done all those things, incorrectly. I'm a running joke out here. At the Home Hardware (Hindy's) out here in Winterton, they just laughed their asses off when I showed up. They were like 'How did you get that job?'" The fact is, while Andrew admits he's qualified for the job based on his own handyman tribulations, his career path was determined more by his flare for the creative, his desire to succeed and his willingness to keep battering until the brick walls fell. The roots of his career in the arts reach back to his high school days and a teacher named Lois Brown. She pushed him and his fellow drama enthusiasts to extend themselves beyond the curriculum. She encouraged them to go downtown and work at the LSPU Hall (where many Newfoundland and Labrador artists get their start) and to surround themselves with writers and creators. Brown's encouragement fostered ambition in Andrew and his peers. Andrew remembers when they first started working in the musty rooms of the LSPU Hall under the watchful eye of Charlie Thomas. His sketch group was pounding away at their first show next door to where Codco was writing the first series of its TV show. "We were teenagers and they (Codco) just thought it was cute and funny and interesting that they had a bunch of teenagers next door to them doing exactly what they were doing - sketches. They befriended us to the point where when I was 15, I was at Tommy Sexton's 30th birthday party," Andrew points out. "So we were really good friends with all those people and that gave us instant street credibility when we were doing a sketch...and there you have Codco standing up in the back. They'd come to every performance we did. And so did the entire downtown art community. They supported the hell out of us kids." He still looks up to the members of Codco. He also respects Rick Mercer and the work he's doing and "...anybody who's kind of just churning stuff out. I'm impressed by people like Don McKellar that write all the time." How Andrew got from performing skits in downtown St. John's to writing and hosting his own TV show is tied directly to his ambition and drive. After developing a rapport around town, he picked up a bit of work on local radio. By the age of 21, he had moved on to TV with a weekly gig doing political commentary on the CBC evening news. "I was always pitching myself around trying to get gigs. I pitched myself to the newscast in B.C., got a job there. From there I started hosting shows. I hosted a show called 'Foodessence' on Life Network, then started working for Undercurrents on CBC," says Andrew. "I was just pitching myself and writing anything I could. I wanted to be an actor all the time, that's what I wanted to do, but I found myself getting more work as a writer and current affairs type person...Every now and again I'd get a job where I was the host, and every time it's happened I wound up taking over the writing responsibilities as well." Today, at 39, Andrew is the only writer for the "Worst" shows, he oversees the editing and he is the creative producer. "I was hired just to be the host, just the frumpy kind of host guy, then I just worked my way up through," he says. When Downhome caught up with Andrew, he'd just finished shooting his sixth season of "Canada's Worst Handyman." While he lives in Toronto, he finds time to enjoy his home in New Melbourne, where he often comes to write and edit, and sometimes gets out for some fishing, hiking or eating lobster on the beach. Aside from the fact that writing seems easier for him in Newfoundland, he says he comes home because "...it's the best place to be!" Staff from The Gaff Dear Downhome; Mike Shufelt and I are collecting stories about the Gaff Topsail, the old railroad community located on the Gaff Topsails, and we need your readers' assistance in identifying the railroad workers in this photo. This group shot was taken at "The Gaff" in 1960 by Ed White, a Frontier College labourer and teacher who was working with the CNR ballast and lift gang. We have the names of his students, perhaps not all those pictured here, and would like some help in matching these up. 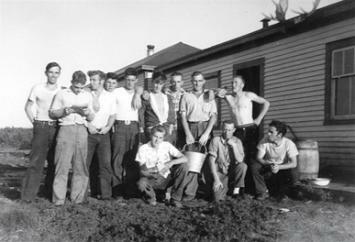 The names we have for the men who worked there and attended classes through Frontier College are: Sonny Croucher, Stanley Rowe, Stan Best, Len Vivian, Jacob Vivian, Ches Smith, Vic Green, Joe Cramm, James Barrett, Eric Barrett, Selby Croucher, Albert Holloway, Max Peddle, Frank Peddle, Cliff Ryan, George Thomas, Andrew Gushue, Eric Prosper, Charles Snook, Pleaman Wheeler, Lester Warren, Francis Webber, Junior Sutton, Arthur Burke, and Walt Little. Any help in identifying the others will be useful. Floyd Spracklin Corner Brook, Newfoundland If anyone can help in this project, you may contact Floyd by e-mail at floyd.spracklin@nf.sympatico.ca, by phone 709-634-5712, or by regular mail by writing to Floyd Spracklin, 10 Ingrid Avenue, Corner Brook, NL, A2H 6P2. Elliott Family Reunion Dear Ron; We are having an Elliott family reunion August 8-10 for all descendents of Thomas Elliott, who was the first settler of Port Albert in 1883 (then known as Little Beaver Cove). Thomas had three sons - Herbert, James and John - and four daughters: Rachel married Joseph Bennett; Rhoda married Gideon Day; Jennie married a Pelley and later, an Ackerman; and Margaret married George Mercer. They were my grandparents. There may be many relatives who we do not know about, and I would like for anyone who has not received an invitation to contact me. I would appreciate your help. Margaret Mercer Port Albert, Newfoundland Descendents of Thomas Elliott, the first settler of Port Albert, who would like more information about the family reunion planned for August may contact Margaret by telephone at 709-241-3271, via e-mail at sidmercer@nf.sympatico.ca, or by writing to her at General Delivery, Port Albert, NL, A0G 3R0. A Puzzling Picture Dear Ron; I've been a Downhome subscriber since last July when I revisited Glovertown, near Terra Nova National Park. My first time in your picturesque province was back in 1983 when I began my park warden career in Terra Nova. I worked there six months before I returned home to Cape Breton. I went back to Terra Nova in 1994 to work for another nine-month term before I transferred to the Quebec lower north shore in 1995. The reason I'm writing is to respond to the letter written by Rev. Walter Sellars from Ottawa, in the June 2008 issue, asking about the picture on the puzzle he found in a second-hand store. Seeing the photo while leafing quickly through the magazine, it seemed to me I had seen this scene before. What triggered my memory is the two Canadian flags (one at the small wharf; the other near the cabin on top of the hill). I could be mistaken but it reminded me of Park Harbour Warden Station, located in Terra Nova National Park. The station used to be manned by seasonal wardens and it was also used for boaters to drop in for information or in case of emergency. Gerald Bourgeois Via e-mail Thanks for your letter, Gerald. I have no idea where this puzzle place is (pictured below), however we've also heard from two other readers offering opinions. Irving Saunders of South River, Newfoundland, thinks it's a cabin located on either Joe's Lake or Crooked Lake just north of Badger on the Trans-Canada Highway; Richard Carroll of Gander also says it's a cabin that can be seen from the TCH, but that it's located at Paul's Lake, between Badger and South Brook. Dolly's Tolerance On YouTube In the March 2008 issue of Downhome, I really enjoyed your article in the "Notes from Home" section about Dolly's Tolerance, the airplane built by Ivan LeDrew. I'm sure many of your readers enjoyed this story as well, which brings me to the reason I'm writing: A video of the Dolly's Tolerance in flight can be viewed online. Just search the phrase "Murphy Rebel airplane amateur built floatplane landing." B. Myles Via E-mail For anyone interested in watching the airplane video, it's on the YouTube Web site at the following page: http://ca.youtube.com/watch?v=HPBU45-7U7o. Teacher and Class Reunion Dear Ron; We are traveling to Newfoundland this summer to spend some time with my family in St. John's. My wife is looking forward to her first trip to one of the most beautiful provinces in Canada. Her parents are coming with us for a week to reminisce about their time spent in St John's in the 1950s as a newly married couple stationed there with the Canadian Air Force. It is their first trip back and most likely their last! While Mr. Harry Hillman (my father-in-law) was in the Air Force, Mrs. Verneal Hillman taught at the Holloway School in 1954-55. I am including some pictures of the school and the Grade 3 class that she taught. I don't believe that the school is still there, but we thought it might be nice to see if some of her former students want to be reunited with their old teacher. Stephen McAllister Edmonton, Alberta If any readers were in Mrs. Hillman's Grade 3 class at Holloway School in 1954-55, and want to see her while she's visiting St. John's, you may contact Mr. Frank McAllister at 709-726-7428, or e-mail him at ranger66@telus.net to arrange a get-together. Seeking White Pudding Recipe Dear Ron; Well another subscription was just placed with your wonderful newsy magazine that I prefer to call a book, as there is so much enjoyment inside those covers. Although I am not a Newfoundlander I feel like one; I have been married to one for 17 years and I love your wonderful province! My husband is from Mary's Harbour and we usually go home every other year. I am looking for the recipe for white pudding and I hope someone in your reading audience will be able to help me with this request. It is one of my husbands favourites and I would like to surprise him. Betty Cumby Via e-mail If any readers can help Betty with a recipe for white pudding, they may e-mail her at dan.cumby-betty@sympatico.ca. Like many Newfoundland communities before Confederation, Traytown had no electricity when Ivan LeDrew was growing up there. Most houses had a radio powered by a special battery that had one section to supply the necessary voltage, and a second section that lit up the electron tubes (unlike transistors, tubes need to be heated to operate). Sometimes one section of the battery went dead before the other, rendering it useless so it was discarded. Ivan, however, was born with a natural curiosity about how things work. This led him, at the age of 12, to dismantle a dead radio battery. Young Ivan knew nothing about electronics at the time, but the discoveries he made from this and other battery dissections steered him towards a successful career in electronics and the means to reach his ultimate dream: building and flying his own aircraft. When Ivan took apart his first battery, he didn't know that one section put out 45 volts and the other only 1.5 volts. It cost him a flashlight bulb to find that out, but it didn't dampen his enthusiasm for exploring. 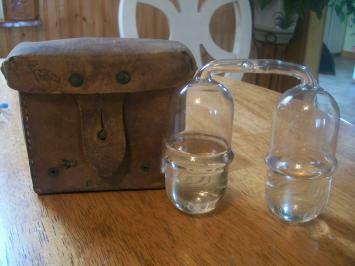 Using the lower voltage section of the battery, he designed an electric lamp with cardboard reflectors, making his bedroom one of the few indoor places in Traytown illuminated by something other than a kerosene lamp. In 1956, at the age of 20, Ivan became a radio operator, a job that would introduce him to the world of light airplanes. Ivan joined the VOCM radio network in 1965 as an engineer, eventually working his way up to chief engineer. He encountered aircraft in a minor way at that time, as VOCM had a contract with the flying school to broadcast airborne reports from as far away as Terra Nova National Park. These flying experiences led Ivan to enrol in flying school in 1974. That same year he turned his part-time sound installation business, Audio Systems, into a full-time venture and he left VOCM. He quickly learned that making a new business successful requires intense focus, you don't have time for hobbies. So Ivan gave up flying. Twenty years later, with the company running well, Ivan dug out his original flying log book and started training again. He also decided to build his own airplane. The "Murphy Rebel" kit, which arrived at his home in January 1996, was a large plywood crate with a price tag of $21,500. Inside were aluminum panels, framing parts, all manner of bits and pieces, and two large instruction binders. The kit did not include the engine, alternator, starter, carburetor, stainless-steel exhaust system, gauges, floats, VHF communications system, wiring or control panel (dashboard), and a host of other things. Ivan had to acquire and install all these. The control panel (including the wiring harness) was his own design. Three years, 22,000 rivets, 1,500 hours and $65,000 later, the "amateur home-built" class aircraft was ready for the big test. 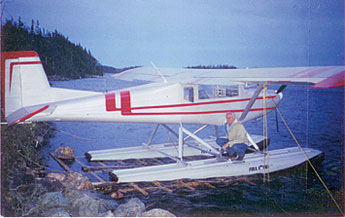 The airplane control panel designed, built and wired by Ivan LeDrew In 1999, on a sunny June day in Deer Lake, Ivan took off from Gull Pond in his float-equipped Murphy Rebel with veteran pilot Bruce Rose beside him. They flew up into the sky without the slightest hitch. On November 6 the following year, Ivan had two other reasons to celebrate. On that date he turned 65 and flew solo for the first time. He went on to earn his recreational flying licence with a floatplane endorsement, allowing him to solo-fly his own creation. 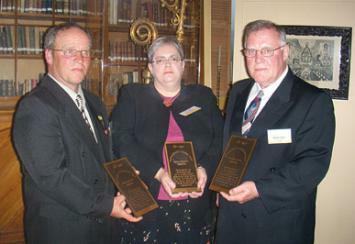 Southcott Award Winners The Newfoundland Historic Trust presented three awards for excellence in built heritage during the 24th annual Southcott Awards ceremony. William Francis, owner of John Hancock House in Portland, Bonavista Bay, was recognized for his family's efforts to restore the structure. The house was originally constructed by boat-builder John Hancock around 1923-1935. The house sits on seven acres of land, near a brook that once fed Hancock's sawmill. Mayor Sam Slade accepted an award on behalf of the Town of Carbonear, which undertook the restoration of the Old Carbonear Post Office (including a clock tower), built in 1905. Finally, Claudia Sommers Brown received an award for the restoration of the Queen Anne-style Moseley/Brown House, located at Dockside - the oldest area of Burin. The house, built in 1900, was once home to Dr. Moseley, who also had his surgery clinic and office there. Rick Hillier Returning to MUN The day after retiring from his position as chief of defence staff (CDS) in early July, General Rick Hillier started his new job as chancellor of Memorial University (where Hillier himself earned a bachelor of science degree in 1975). Hillier's retirement came after three years as CDS, during which he presided over Canada's mission in Afghanistan. Vice-Chief of Defence Staff, Walter Natynczyk, will assume his position. Hillier takes over from the university's previous chancellor, John Crosbie, who was appointed lieutenant-governor in January. Cleary Brings Home the Cup Thousands gathered in Harbour Grace, Newfoundland, to welcome Daniel Cleary - and the Stanley Cup - on Canada Day. Cleary, as a member of the Detroit Red Wings Stanley Cup champs, arrived in his hometown with the coveted cup via motorcade, which passed by throngs of excited fans lining the streets. Premier Danny Williams attended the event and treated Cleary and the crowd to his rendition of the song "Oh Danny Boy." Despite sometimes rainy conditions, fans waited in a lineup for hours just to touch the Stanley Cup, which, for the first time, bears the name of a Newfoundlander. Flipping for 17th-Century Coin Archeologists excavating the Colony of Avalon site, near Ferryland, recently made a significant find - the first archeological discovery of a whole gold coin in Newfoundland and Labrador. The 22-karat gold Scottish "Sword and Sceptre" coin is dated 1601, during the reign of King James VI of Scotland. At that time the coin would have been worth six pounds - or 120 shillings - considered a significant amount of money then. On the obverse are the crowned arms of Scotland (rampant lion) and the Latin inscription that translates into English as "James VI, by the Grace of God, King of Scots." On the reverse: a crossed sword and scepter are flanked by two thistles, all below a crown, along with the Latin version of "The safety of the people is the supreme law." The coin is on display at the Colony's interpretation centre. A Mountain for Maddie St. Lawrence, Newfoundland-native Paul Lambe is due to complete an inspirational climb to the top of Mount Elbrus in Russia in honour of a courageous and selfless child named Maddison Babineau (Maddie) early this month. Four years ago, Lambe had just returned from climbing Mount Kilimanjaro in Tanzania, Africa, in aid of ALS research when he learned that the 12-year-old daughter of a fellow climber was diagnosed with an aggressive bone cancer called Ewing's Sarcoma. During her treatment, Maddie was granted a wish from the Children's Wish Foundation. At the child's request, the foundation donated $6,500 towards building a school in Africa. Maddie recovered but the cancer returned when she was 15. From her hospital bed, Maddie sold jewellery to raise funds to build a well to provide drinking water to students at the African school her wish had funded. When the cancer returned a third time, Maddie decided she wanted to raise enough funds to build a whole village in Africa. Sadly, she passed away in May 2007. But Paul and others have taken up her cause. To find out how you can help make Maddie's dreams come true, and to read more about Paul's inspirational journey, visit www.maddieswishproject.com. Dear Downhome; This was found when a buddy of mine tore down his grandfather's shed. Nobody seems to know what it is; I don't even know myself, but would really like to find out. My friend figures it might have something to do with schooners. Can someone please enlighten me? Barry West Carmanville, Newfoundland If anyone knows what this object is, and what it's used for (or was once used for), please leave us a comment. Comments may appear in an upcoming issue of Downhome.